Commuters at Blackrod Station are having the proverbial excrement dropped on them from a great height: From 14th December, Northern Rail are switching Manchester bound trains which currently stop at Deansgate, Manchester Oxford Road and Manchester Piccadilly to Manchester Victoria. Not surprisingly, this causes problems for those reliant on the service to get to work, according to comments on Phil Morgan’s Blackrod Station website, with increased journey times, inconvenient changes that were not previously required and in some cases, additional childcare costs because the commuter can no longer get to work on time after dropping her daughter at school. Many also question the apparent discrimination against Blackrod when more trains stop at Lostock. Why is Blackrod treated in this way? Being so close to the GM border, is it a case of ‘out of sight, out of mind’? Could this be the start of the rot? How long before the number of trains are run down as low as Clifton? Ironically, these are the one set of commuters (city centre workers) who would actually benefit from the TIF proposals, yet GMPTE see fit to allow Northern Rail to ride roughshod over them in this manner. It also highlights the fact that when you become dependent on public transport, you put yourself totally at the mercy of the transport operator who won’t hesitate to put their interests over the paying passenger. This is the so-called ‘world class’ system we are being promised by Richard Leese – No thanks. Why should 1 in 10 pay when they won’t benefit? We can argue until the cows come home about the accuracy of the ‘only 10% will pay the congestion charge” claim of the Yes Vote campaign (it’s 20% according to the TIF consultation brochure), but let’s play along. The pro-toll advocates say that it will only be 10% because others will be able to switch to a viable alternative (I can’t as previously posted). Following this logically through, this means that the remaining 10% are precisely the ones for whom the TIF proposals will not provide a viable public transport alternative. So basically, the yes campaign are happy to promote the notion that the improvements should be paid for by those who can’t benefit from them. You’ve got to hand it to the Manchester Congestion Charge ‘Yes Vote’ camp: their lack of targeting their advertising properly is helping to galvanise the ‘no’ vote. 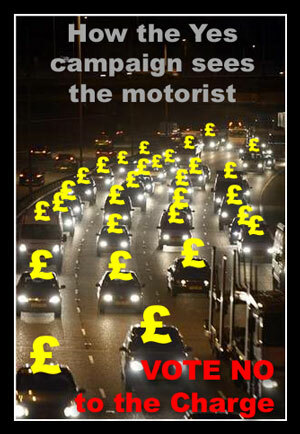 The pro-toll’s decision to go with the ‘I won’t pay’ adverts has only angered those who will have to pay. Couple that with fact that these have been sited along routes which will not receive funding to provide an alternative and you only reinforce people’s decision to vote no. Now, having realised that, they have switched to a ‘that sounds fair’ slogan, but you have to question the wisdom of large bill-board posters proclaiming the building of Metrolink routes smack in the middle of those areas that will never have the benefit of Metrolink. Again, when the lack of Metrolink is a sore point, this only reinforces a no vote. Well done – keep it up! In the past three weeks, I have contacted a number of people regarding the Manchester Congestion Tax. It is interesting to note the lack of response from the majority, without even the decency of a simple acknowledgement from some. Not a very impressive set of figures really; only three replies. Given Ruth Kelly’s lack of response in the past, I don’t hold out much hope. I will keep this post updated. Only ten minutes after hearing the excellent result of the referendum, I arrived home to a letter from Ruth Kelly, but far from actually replying to my concerns, it would appear that she has simply forwarded my letter to GMPTE whose reply she has simply forwarded back to me without comment. A secretary could have done that! It clearly stated in my original letter that I was fully aware of GMPTE’s attitude, so what was the point of getting them to repeat their propaganda? Given Ruth Kelly’s support for the TIF bid, it would seem that she is simply sitting on the fence. Heavy rail rolling stock and associated infrastructure (platform extensions, turnbacks, depots and stabling). These costs are now assumed to be met by the Department directly through the TOCs (Train Operating Companies) and Network Rail rather than through TIF grant to Greater Manchester and Prudential Borrowing cover. AGMA are actively promoting extra carriages and platform extensions as part of the TIF package, yet they are clearly not. Oldham and Rochdale may not pay any congestion charges until Metrolink extensions to their town centres are complete. Other outlying areas – such as Stockport, which hopes to get a Metrolink line in the future – are also likely to avoid the charges for the first year. Yet there is no mention of other outlying areas, such as Bolton and Wigan, who will NEVER get the Metrolink, yet are getting no such exemption. Is it any wonder, Bolton and Wigan don’t want to be lumped in as part of Greater Manchester when they are discriminated against in this way? As it happens, it would appear that AGMA have reneged on this exemption and only Trafford Park is getting a 50% discount until they get some more buses, but this clearly shows how some areas are considered more equal than others. It still amazes me how they make it sound as if they actually believe their own bull. Already getting them mate – nothing to do with the TIF. and an earlier morning train could operate from Clitheroe to Manchester via Bolton in the mornings to further ease overcrowding. Wow! A Whole Train! I can hardly contain my excitement. Also note the word ‘could’. Bolton station could undergo extensive improvements, with new platforms built on the Wigan line at Lostock station. Passenger facilities at Hall i’th’ Wood, Bromley Cross, Lostock, Blackrod and Westhoughton stations could be improved. There’s that word ‘could’ again, twice this time. I’m not particularly interested in improved facilities at Blackrod. I just want to turn up and get on a train. cyclists will see the creation of a high quality route along the former Bolton-Bury rail line. How about a rail line along a rail line (there’s a novelty) and reverse some of the damage caused by Dr Beeching? Extra seats we’re already getting and Metrolink lines we won’t. and a travel smart card system. Perfectly achievable without congestion charges by politicians with the balls to make the bus/train companies comply – ah wait, I see the problem with that last statement. To help fund this, a limited congestion charge would be introduced, affecting vehicles heading towards the city centre between 7am and 9.30am and away from the city centre between 4pm and 6.30pm, for five hours out of every 24. Please, please, everyone quoting this last remark, get it through your thick skulls: There is nothing limited about a congestion charge which is in force for FIVE HOURS during the working day, and 100% of the time that most workers will be travelling. Stop claiming it is limited. The following is my response to the TIF proposal consultation document. The concept of the TIF bid is fundamentally flawed, as the proposals do not provide a viable alternative to car transport, particularly to residents of Bolton and Wigan. Rather than just rejecting the idea, I have actually taken time to research and consider alternatives to using the car. Let’s take a look at those alternatives. I will be referring to the table on the right which compares relative journey times and other factors. Click the table for a large readable version. I live in Horwich, only ten minutes walk from Blackrod railway station, and work one mile inside the M60 (the proposed outer charging zone), right next door to Clifton railway station on the same Preston-Manchester line as Blackrod. It would seem an obvious choice of transport, yet it is not actually possible for me to get the train to work, as there is no service at Clifton*. I have taken this up previously with the GMPTE and have written replies from them stating that they have no intention in rectifying this situation and nothing in the TIF proposals will either. I believe I am in a very small minority of commuters who live and work adjacent to railway stations on the same line; if GMPTE can’t handle that very simple public transport journey, what hope is there for the rest of Greater Manchester? * One train a day that is too early to actually connect with does not constitute a service. If there was a service, it still loses out to the car on anything but a bad day time wise, and on all other factors (see table) every time. Even the best option, a direct (non-existent) service would take 48 minutes compared with an average car journey of 37 minutes, or 24 minutes on a good day. In reality, if the train did stop at Clifton, it would not be the Preston-Manchester service, but the Blackburn-Manchester service. This would therefore involve changing trains at Bolton increasing both the journey time to 59 minutes and the risk of being affected by cancellations and delays.